I love to have a special breakfast on a lazy weekend day. The problem, of course, is that I don’t want to make breakfast on a lazy day. It seems like it defeats the purpose, right? I’d much rather have it without all the effort. 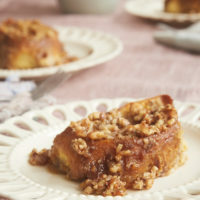 That’s where recipes like this Praline French Toast come into the picture. The majority of the work and assembly is done they day before serving it. You’ll just need to spend a few minutes making an easy topping before popping it in the oven. Then you can immediately return to your lazy plans while it bakes. 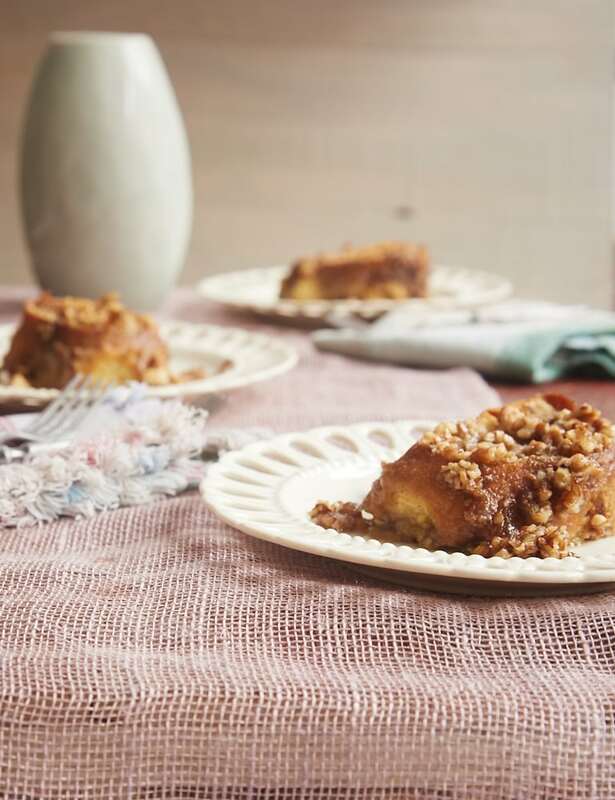 Baked French toast is essentially bread pudding, but it’s even easier and quicker because you use bread slices instead of cubes. If your supermarket stocks that nice, wide French bread, then you’ll need about 8 thick slices of bread. I am fortunate to have a lovely bakery in the neighborhood that makes really amazing baguettes. They are narrower, but they work really well for this recipe. If you use a baguette, just keep in mind that you’ll need more slices to fill up the pan. 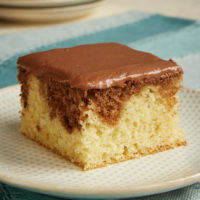 Yes, this is a really simple make-ahead recipe, but what I most love about it is the flavor. If you love pecans like I do, then I think you’ll whole-heartedly agree. 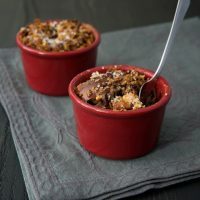 The topping combines brown sugar, butter, maple syrup, and pecans for a deliciously sweet topping with the taste of pralines. 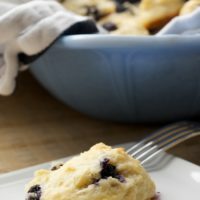 Keep this recipe in mind the next time you need breakfast or brunch for a lazy day or a special occasion. The make-ahead aspect makes it so simple, and it’s destined to be a crowd-pleaser. 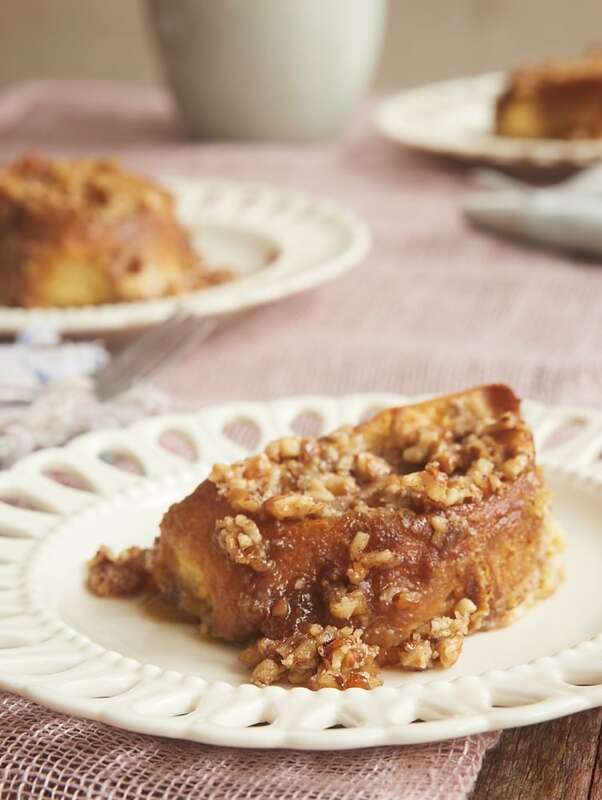 You can enjoy the adulation as you serve this Praline French Toast warm from the oven. Find more breakfast recipes in the Recipe Index. 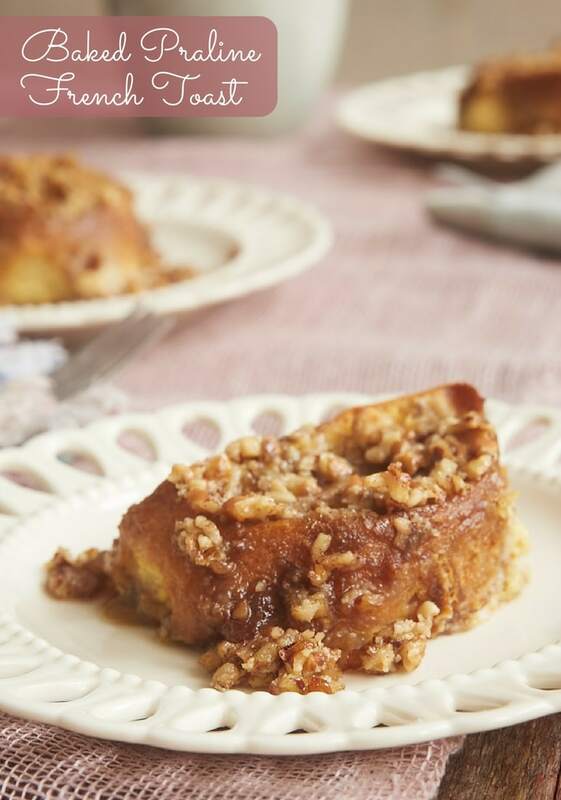 Baked Praline French Toast is a fantastic make-ahead breakfast with the irresistible flavors of pecan pralines. 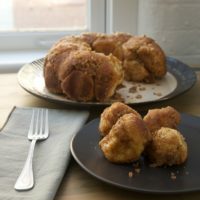 Whisk the eggs, milk, cream, brown sugar, and vanilla until combined. Pour about a cup of the egg mixture into the bottom of a greased 9″x 13″x 2″ baking pan. Arrange the bread slices in the pan, laying them flat in the bottom of the pan. Pour the remaining egg mixture over the bread. 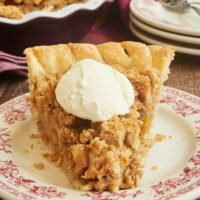 Place the butter, brown sugar, maple syrup, and salt in a small saucepan. Cook over medium heat, stirring frequently, until the sugar has dissolved and the mixture is smooth. Stir in the pecans. Pour the topping over the chilled bread. Bake 30 to 35 minutes, or until the bread is golden and a thin knife inserted into the egg mixture comes out clean. *I used most of two small French baguettes, which are not as wide as store-bought French bread. If you do the same, you’ll need more slices to fill the pan. Recipe slightly adapted from My Recipes. I love overnight french toast kinds of dishes. It’s easy and your time isn’t taken up with doing it all early to have it ready for breakfast. Perfect! Can’t wait to try this version. If you came up with it I know it is a winner! Thanks, Jennifer. thank you for the gift that is all things praline and applying them to other things and making the world a better place. 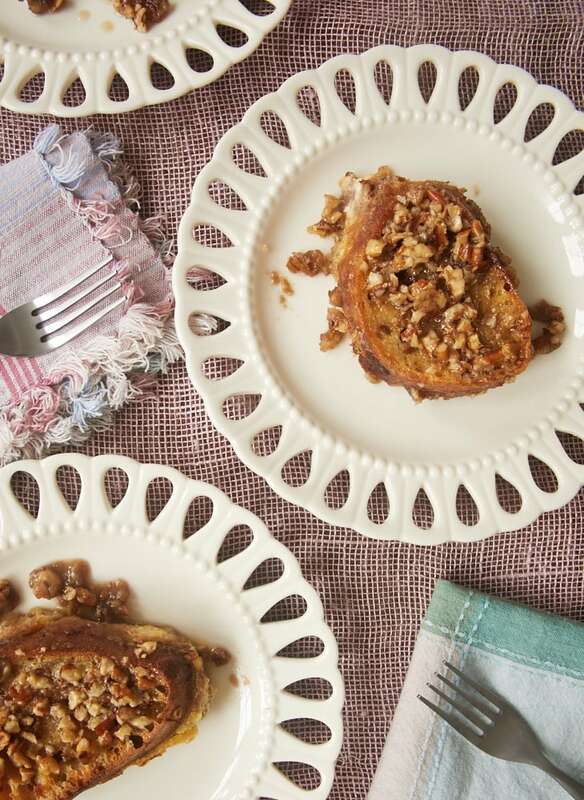 This french toast is clearly divine. Hi Jennifer I have a few croissants left and I’d like to try this recipe, do you know about how many grams of bread you used for this recipe? It’s very difficult to calculate the weight of 2 small french baguettes, since every brand is different, is far more accurate if we know the weight so we can use any bread we have available. 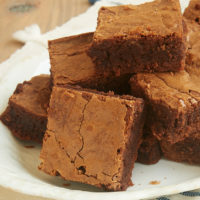 Thank you very much for your lovely recipes, and I’m glad to see that you’re introducing the metric system in some of your new recipes , which make it easier to follow you. Hi, Adriana. Croissants are lighter and more airy than a baguette, so weight may not be that helpful. For this recipe, it’s more about using enough bread to cover the bottom of the pan in a single layer. I’d try cutting the croissants into 1-inch slices just like I did with the baguette. Hope that helps!